Usually when I do a house project, my biggest incentive for getting it done quickly is so I can get back to working on the railroad. I'd planned a week for this living room project, but as we go into a third week now, we've decided to have somebody else refinish the wood floors we discovered under the wall-to-wall carpeting. The bad news is that we're still waiting for the last estimate/bid to come in. But turns out that's the good news too - until the floor's done, we can't do anything else. So I'm able to get back to the basement. Bill came over to help me assess some things. Long story short - I decided to take a break from Saybrook (have some reworking ideas to consider) and start some scenery(!) Heh - problem was (as sometimes happens with such visits) we ended up chatting/analyzing/considering so much that by the time we were ready to start scenery, it was time for Bill to head home. No problem though - we at least started to get a handle on what supplies I had on-hand.... and what more I needed to get. 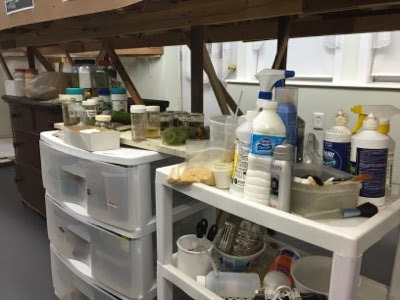 This is what I have on-hand: a pretty comprehensive, though hodgepodge, collection of Woodland Scenics ground foams, some trees that friend Pete made during a long-ago scenery work session for the modules, and various/sundry other related items & tools. Great for a 1980s/90s layout - and it'll all be useful at some level - but model railroad scenery technology has changed a lot since I first got into the hobby. Now it's a lot about Super Trees & static grass. So, after consulting another modeler who does the best New England Autumn scenery I've ever seen (thanks Marty!! ), I put together a shopping list, decided to take a deep dive into my railroad fund, and got on the Scenic Express website. The order just arrived today - and this isn't even all of it! 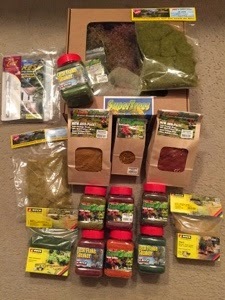 In addition to the box of Super Trees, I ordered a variety of autumn-colored static grasses, leaf material, and misc other items. There are a couple things on back-order, but it looks like I'll be able to get started on scenery with a vengeance soon! I can think of a lot of modelers who are better scenic artists than me, but thanks for the kind words. Hope the rough draft of the article proves useful - can't wait to see some of your Scenic Express haul installed bring the layout to life!